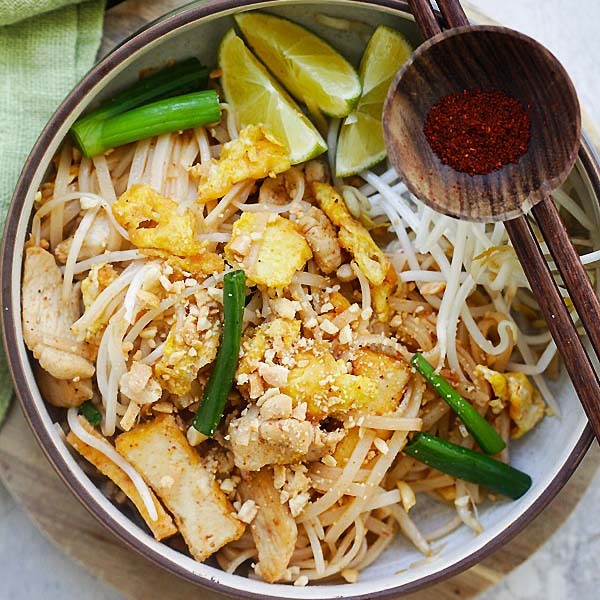 Quick and easy Pad Thai with chicken. Learn how to make this amazing Thai stir-fried noodles with a sweet and savory homemade Pad Thai sauce. 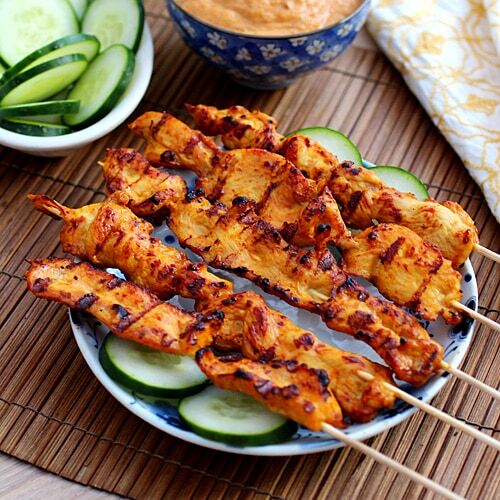 It's so good you don't need another takeout again! Pad Thai is a popular stir-fried rice noodle dish found in Thailand. Pad means stir-fry, so literally it means Thai stir-fry. 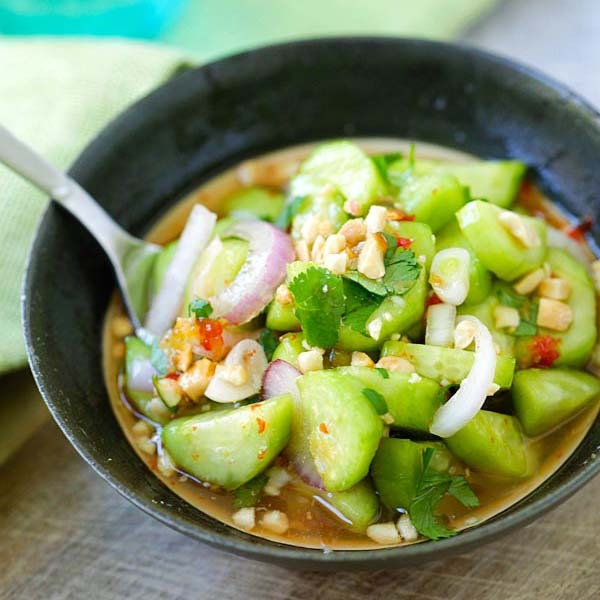 It’s sold by street food vendors and at casual restaurants in Thailand. I love my Pad Thai with a variety of ingredients but Chicken Pad Thai is probably the most friendly as everyone loves chicken. I have a super easy Pad Thai sauce recipe that’s made with pantry ingredients so there is no need to shop at Asian or Thai food stores. There are many kinds of Asian noodles in the market and it can be confusing. For Pad Thai, you want to use packaged Dry Skinny Rice Stick. The noodles are are about 1/10” wide. There is a Dry Wide Rice Sticks which is 3/8″ wide. You can use either of them but I personally prefer the skinny version. Method/Directions: Cook the rice sticks according to the package directions. Mix the Pad Thai sauce. Chicken Pad Thai is very easy to make at home and a crowd pleaser. Stir fry the garlic and chicken, tofu and rice sticks. Scroll down for the detailed recipe. 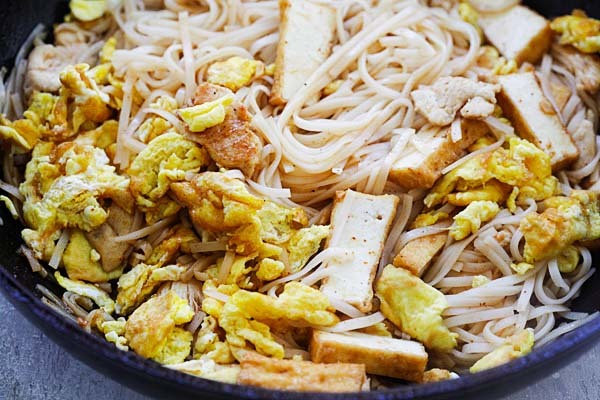 Make the Pad Thai Sauce by mixing all the ingredients together. Set aside. Heat the oil in a wok or skillet over high heat. Add the garlic and stir fry until aromatic. Add the chicken, tofu, and continue stirring. As soon as the chicken changes color, add the rice sticks and stir continuously, for 30 seconds. Use the spatula to push all the ingredients to one side of the wok or skillet. Add the eggs and let cook for about 1 minute or until the bottom sets. Fold the noodles over the eggs, and then add in the Sauce. Stir continuously until everything is well combined. Add the bean sprouts, scallions and do a few quick stirs. Turn off the heat and topped the noodles with the crushed peanuts. Serve the noodles immediately with the lime wedges. If you want to make it with Shrimp, check out my Shrimp Pad Thai recipe. All photos and recipes on Rasa Malaysia are copyright protected. Please do not use the photos and recipes without prior written permission. If you wish to republish this recipe, please rewrite the recipe in your own words instead of copy and paste and link back to //rasamalaysia.com/chicken-pad-thai/. Thank you very much! Thank you for this simplified and delicious recipe. Not everyone wants Pad Thai for breakfast, but I did mix up the sauce this morning in prep for lunch. I do plan to add some additional veggies–small amounts of snow peas, slivered carrot, slivered red bell pepper, which are all things I have on hand in my fridge and will add both color and flavor. I sometimes use Pad Thai as an excuse to use up leftover veggies, but in this case have some fresh stuff on hand. I had a question about the chili powder, which means different things to different people–most of us here in the US think of TexMex style chili powder which includes garlic powder, oregano, cumin, and lots of salt in addition to powdered chilis. Given my uncertainty, I skipped it and used about that amount of Chinese chili paste with garlic. I also used Japanese rice vinegar which is readily available in my supermarket. The sauce is spectacular and I look forward to lunch!!! Hi Janet, I used pure chili powder. Great that you love my chicken pad thai recipe. I fall in love at the first time I tried Pad Thai in Thailand. Yours is as good as the one I first tried. 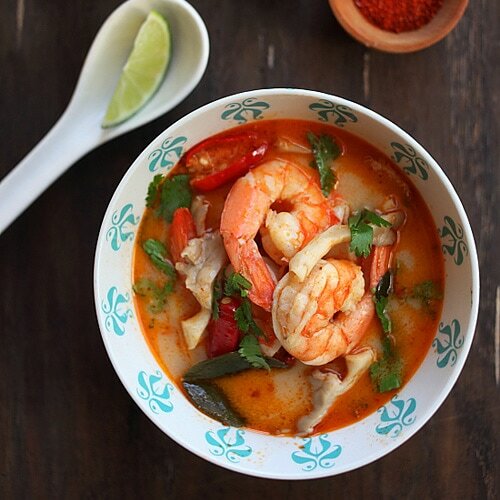 Simply makes me want to head to Thailand for their amazing food again. I have to admit, I was skeptical that I would like this. I absolutely love pad Thai and all the other ones I’ve tried always turn out with a peanut sauce and just not right. This was amazing. It solved my take out craving!!! I didn’t have any peanuts on hand so I just added like a 1/4 tsp peanut butter to the sauce to add a hint of the peanut flavor you get with the peanuts and it was perfect!!! Thank you! First recipe of yours I have tried and I will be coming back for more! !